Republicans and Democrats in the United States are already arguing over the semantics of terrorism — watch for reports in the coming days that muddle the difference between Khattala’s militia and the Benghazi-based Ansar-al Sharia with the larger al-Qaeda in the Islamic Maghreb (AQIM), which Kirkpatrick reports has a stronger hold in Libya today than it did at the time of the Benghazi consulate attack. But that misses the point — whether they were separate (as appears to be the case in Libya) or connected (as appears to be the case in Yemen), it’s sustained US intervention that’s empowering local radicalism. When the United States intervenes in the internal politics of a country, it is going to make some enemies, so it’s worth considering the long-term effects of US action in a new place. If US intelligence can miss such an important point in Libya, a country of just 6.2 million residents that are relatively more inclined to pro-American sentiment for the NATO role in overthrowing Gaddafi, what does US intelligence miss in a place like Pakistan with 180 million people? That’s as true in Libya as it was in Iraq, Afghanistan, Pakistan, Yemen or elsewhere in the Muslim world. That doesn’t mean that Stevens and US officials weren’t working for the best interests of post-Gaddafi Libya. But you also have to remember that in the late 2000s, the US government briefly set aside decades of antipathy for Gaddafi when he disclaimed interest in nuclear weapons and expressed interest in allowing foreign development of Libyan oil fields. So, as Kirkpatrick reports, many Islamists who despised Gaddafi also despised the United States in nearly equal measure. By way of comparison, it also doesn’t necessarily mean that the United States doesn’t have a right to use military force to attack radicals that are working to carry out terrorist plots in Yemen, but it does mean that if the United States deploys scores of drone strikes, it’s certain to engender outrage among locals when those drones drop cluster bombs that kill innocent civilians. Civilian deaths have become especially problematic as the Obama administration popularized the use of ‘signature strikes’ — attacks that have no individual target, but that are instead designed to target a certain demographic of young men in certain high-target regions. In Yemen, there’s plenty of evidence that this is making AQAP more popular and the United States incredibly unpopular, fueling the kind of anti-American radicalism and risk of retaliation that the strikes were intended to ameliorate. That’s especially true for the Middle East, not because of religion or even because of economic stagnation, but because so much of its population is so young. The median age in Mali in 16.2, in Yemen 16.4, in Somalia 17.6, in Afghanistan 18, in Iraq 20.6, in Pakistan 21.2 and in Libya 24.2. Compare that to the United States (36.9), South Korea (37.9) or France (39.7). What it means is that most of today’s ‘militants’ were infants at the time of the original 9/11 terror attacks in 2001. In light of ‘signature strikes’ against 21-year-olds in north Waziristan along Pakistan’s northwestern border with Afghanistan, it’s not hard to wonder if the cycle of perpetual ‘war on terror’ might never end. Nowhere has the failure of US policy been clearer than in Somalia, where US support for warlords in the 1990s and 2000s, ostensibly to fight ‘militants,’ continually undermined any kind of central government — one of the reasons that so many regions of Somalia (like Somaliland, Puntland and Jubaland) today function as de facto independent countries. When the Islamic Courts Union emerged as something of a competent government in 2006, US planners worried that it would be too Islamists, and quickly sent military aid to Ethiopia, which soon waged a proxy war on Somalia. The resulting mayhem provided a vacuum for power, and the 2006-08 war, featuring US-based Christian soldiers from Ethiopia invading the Muslim Somalia, empowered a local radical group, al-Shabab that, by 2010, would come to control nearly all of southern Somalia and parts of Mogadishu. Today, al-Shabab’s territorial hold on Somalia is smaller, but it has deeper ties to al-Qaeda and other international groups, and it showed it is capable of lethal force earlier this year in September when it launched a ruthless attack on civilians at Westgate Mall in Nairobi. 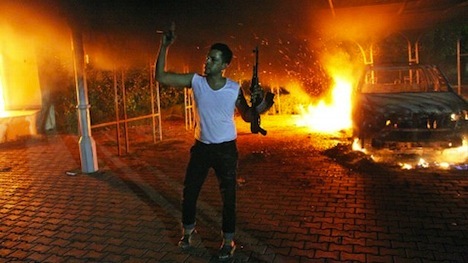 The US left and the US right are already going another round over Benghazi, but it’s not clear that either side has taken to heart to real lesson of what it means to deploy military force throughout the Muslim world in a nearly perpetual state of ‘anti-terror’ warfare — though those lessons are so tragically clear, even to an eccentric, perhaps demented, third-rate militia leader in Libya. Photo credit to Getty Images / AFP.